I don't celebrate Christmas. There's always a moment of utter shock when people first find out. Their eyes widen and their mouth forms a surprised O. Their shock is inevitably followed by utter sadness and sympathy. The consoling pat on the arm, the light hug, the pitying smile. And I'm forced to play along because that seems like the appropriate reaction. I smile sadly, with my eyes downcast. But truth be told, I'm kind of rejoicing at the prospect of a few days off from work. I'm thrilled to be avoiding the overcrowded malls filled with stressed out shoppers hopped up on egg nog, and good god am I glad I don't have to force my family into matching outfits for a Christmas picture. These days, it's enough of a win when we're wearing clothes NOT covered with oatmeal or mashed bananas. Planning matching outfits would likely push me over the edge. Plus, not celebrating Christmas allows me to focus on one of my my most favorite parts of the Christmas season. The Christmas cookie swap. I am not sure who came up with this tradition but seriously, we should give that person a medal. It's utter genius to get together with your friends, eat cookies, oh, and bring more cookies home. So when Patty suggested a blogger cookie swap, it took me approximately three seconds to agree (it would have been two but I was eating a cookie at that very moment). I mean, a cookie swap is already pretty fantastic. 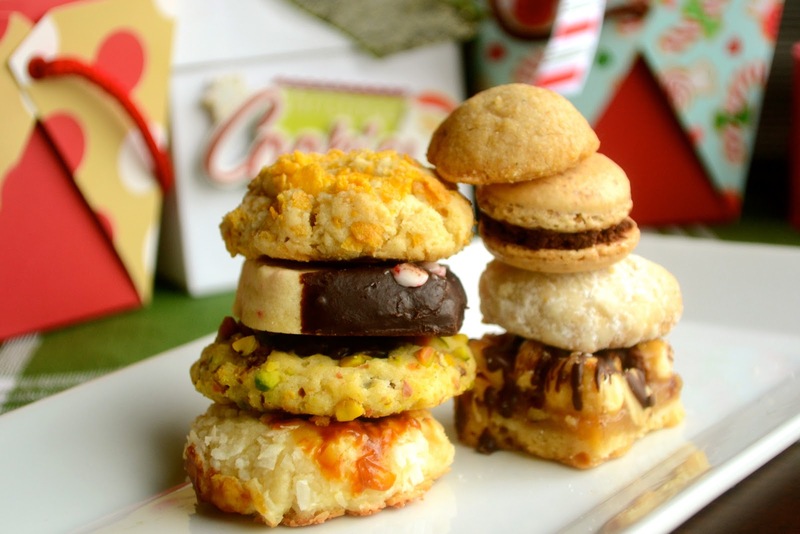 A blogger cookie swap? Heck, that's uber fantastic. Give a group of people who like to bake the opportunity to bake for others, throw in some Christmas wrapping, and an afternoon of chatter and laughter about food, and you can pretty much expect awesomeness. And of course, my bloggger friends did not disappoint. 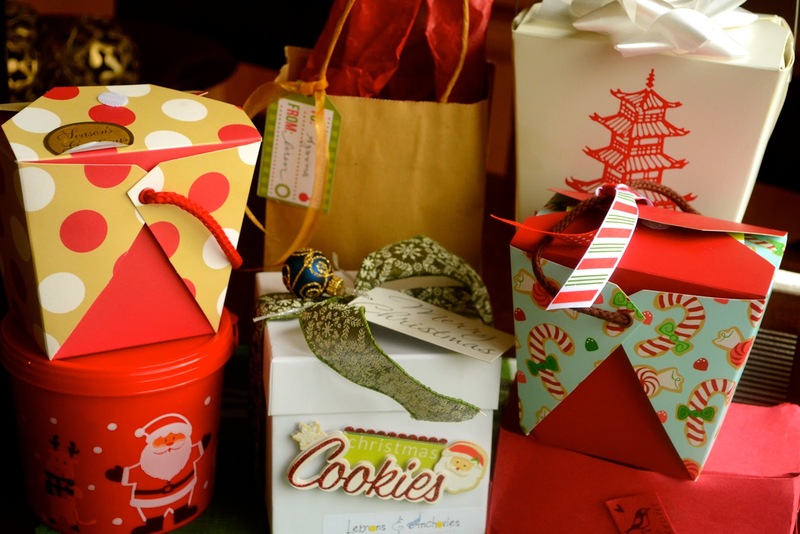 We gathered on a cold rainy day in San Francisco carrying boxes of magical, delicious cheer. Our fabulous host Patty brought shortbread layered with caramel and hazelnuts, Jean brought buttery Russian tea cakes, Lisa brought thumbprint cookies covered in her amazing homemade salted caramel, Gina brought chocolate-caramel cherry thumbprint cookies, and Liren brought perfectly decadent coconut cookies (dreamed up by her daughter! Clearly, a cookie connoiseur). I was also lucky enough to meet some new blogger friends who came bearing cookie treats. Bonnie brought Chinese cornflake cookies while Rose brought mini macarons and Indian-spiced cookies. And if all those treats weren't enough, I brought Cinnamon Bun Biscotti. I mean, my love of biscotti is fairly well documented. But I knew a blogger cookie swap demanded a more special biscotti. So there I was brainstorming on my commute home when it hit me. What if I could take the flavors of a cinnamon bun and turn them into a portable cookie? And so at about 10 p.m. the night before the cookie swap, with a kitchen covered in cinnamon and sugar, I concocted this perfectly swirled, whimsical little biscotti. And if having a giant box of Christmas cookies wasn't enough, the good folks at Tully's sent over some of their fabulous Hawaiian blend coffee, a "bold" medium roast, which pairs perfectly with a cookie (or two or three). So don't feel bad for me friends. While I don't celebrate Christmas, I certainly celebrate Christmas cookies! Line a large baking sheet with parchment paper or a Silpat (god knows how I lived life without a Silpat). Whisk the flour and baking powder in a bowl. Beat sugar, butter, and salt to blend. When the sugar-butter mixture is creamy, beat in eggs, one at a time. Add the flour mixture and beat until just until blended. Divide the dough in half. Knead the cinnamon into half the dough. Sniff your hands repeatedly and bask in their cinnamon'y scent. Now depending on the kind of cinnamon you are using, you may or may not knead to add brown food coloring. If you are using regular grocery store cinnamon, you will knead at least 3-4 drops of brown food coloring. Do not fear if you don't have brown food coloring. Start with 2 drops each green and red food coloring. Knead. Add more food coloring (in 1 drop increments) until you get a darkish brown dough. Note that you'll want the brown to be fairly dark to get a nice contrast. Form the light-colored and brown doughs into two oval shaped discs (approximately 10 inches by 3 inches). Gently place the brown dough oval on the light-colored oval and press down. Roll the dough like you would a cinnamon bun. Press down to eliminate any air pockets. Shape the dough so you now have one log that is approximately 10 inches by 2-3 inches. Place the log onto the baking sheet and bake until light golden (approximately 25-30 minutes). Cool for 30 minutes. Using a serrated knife, cut the log into 1/2 inch thick slices. Arrange the biscotti cut side down on the baking sheet and bake again until gold (approximately 10-15 minutes). Trasfer biscotti to a rack and cool. I'm trying to decide which to be more jealous of; you being at a cookie swap with all those amazing people or the fact that they got your cinnamon bun biscotti. It looks delicious. Of course, every single thing you mentioned does! I've never been to a cookie swap before and frankly, I'm a bit scared to participate. My baking skills are nowhere near where they should be! Love your biscotti...those are my favorite type of cookie. I can't bake, this makes a cookie swap pretty attractive to me and pretty scary for my friends :) Someday I will conquer the oven, but for now I will just look at your photos! Simply fabulous!! Firstly, I'm envious of your swap. One of these days I want to come too! And secondly, these biscotti are dreamy. I can't get over the presentation with the layers, and I know of a certain group of 13 year old girls would could devour a batch in nothing flat. I'm hoping to get them made for the last practice next weekend!!! Ha ha i love how you play along when they are shocked when they hear you don't celebrats :-) cookies look so good. A blogger cookie swap is such a good idea! It makes me want to live in an area where there are actually other bloggers. I am super impressed with your cinnamon bun biscotti. This is such a creative idea - combining two awesome treats into one! These biscotti look amazing! I too never celebrated Christmas but I love the season and all the yummy goodness surrounding it. Cinnamon bun biscotti sounds like such a great idea. Although I celebrate Christmas (and love it) I respect that everyone has their own meaningful holidays. I hope you post about yours sometime! You are smart for avoiding the chaos. Super smart for making us these. Loved the swirled look and was wondering how you made them. I bet the smelling of the hands was what made them taste extra special. They were gone so fast I didn't get a pic. My niece Shelby spied them and was all over them. I had such a great time and I'm so glad you were there. Enjoy your days off. You know...I would be quite content to do away with all the stress of Christmas and just make/eat/exchange cookies. Obviously I need to start celebrating this holiday the Amina way. What a cool idea! I am always looking for a new biscotti recipe. Can't wait to try it! I'm on board with you, not celebrating Christmas but totally celebrating cookies! 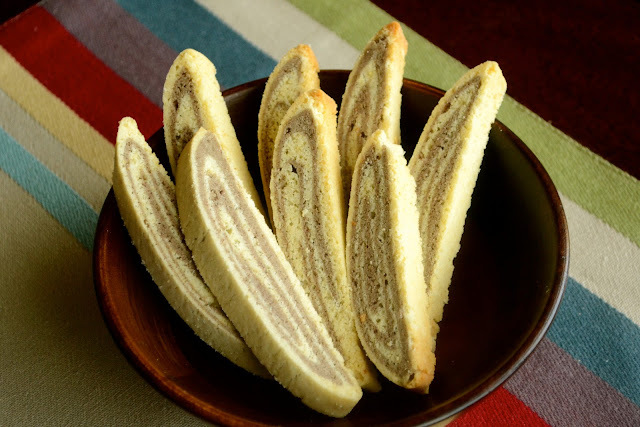 I love the way the swirls in these biscotti show up. I've never made biscotti. I've always approached cookies overall with trepidation, though I'm a big fan of consuming them. These are sooo pretty! That first picture drew me in! Love the idea of combining these two delicious foods. And I think cookie swaps should occur monthly and not just in December! I really live biscotti with tea. Cinnabon biscotti is just brilliant. Oooh.. Just imagine dipping it in some cream cheese glaze. Glad you has fun. Such a great idea. Such a FUN day! Sorry you missed the lunch portion but so glad you made the exchange. Your cookies were divine! I served all the cookies at a dinner party I threw 2 days later and they were a hit! Happy New Year!